We mourn the untimely loss of an artist, comrade, and friend who had been one of standard-bearers of our party during the local elections in May last year. Tado rose to national prominence as a film and TV comedian whose brand of entertainment was both witty and socially relevant. Beyond his comedic countenance, Tado had also lived a full and committed life in service to the masses. We have known him since his early teens, when he stayed at our activists’ office as a member of Panday Pira, a cultural group, which had been helping us in painting protest murals in rallies and street actions. Even after he became a showbiz icon, Tado continued his social advocacies and support to the poor people in Marikina and nationwide. He was a perennial presence during protest activities, the most recent were protests against political dynasties, trapo (traditional politicians) rule, the pork-barrel, environment and mining issues, and others. In fact, his death from a bus crash in Mountain Province was in pursuit of a “40 Mountains Project”, a project where he intended to cross 40 mountains to celebrate his coming 40th birthday. This was intended to celebrate the beauty of Philippine mountains and forests endangered by rapacious mining and logging activities by big corporations. 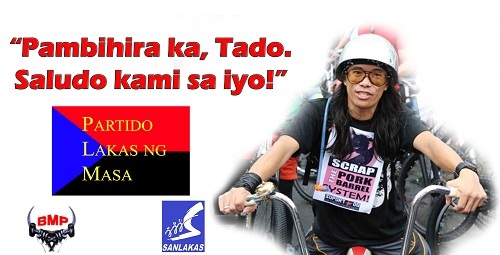 In the May elections last year, Tado ran as a councillor in Marikina, under the banner of Partido Lakas ng Masa. After failing to gain a seat in the city council, Tado declared that he did not lose the elections, but gained tens of thousands of supporters instead. Tado and the PLM knew that it was a herculean task to compete with the local trapos and the entrenched political dynasties in Marikina, but Tado had decided long ago to continue struggling against the electoral system, if only to reach out to a growing number of people. Tado was also an indefatigable and jovial spirit during trying times. Together with PLM and other groups, Tado initiated the first people’s caravan that distributed relief materials in the devastated areas of Samar and Leyte a week after the Yolanda disaster. His disposition during the six-days’ caravan energized the entire team and helped ease the load of many survivors during the relief operations. PLM extends its deepest condolences to his wife and four children, the rest of the family, and all friends and supporters of Tado. Pambihira ka, Tado, we salute you!